Apple has just seeded the 3rd beta of iTunes 10.5.1 to developers with performance enhancements and some stability improvements. 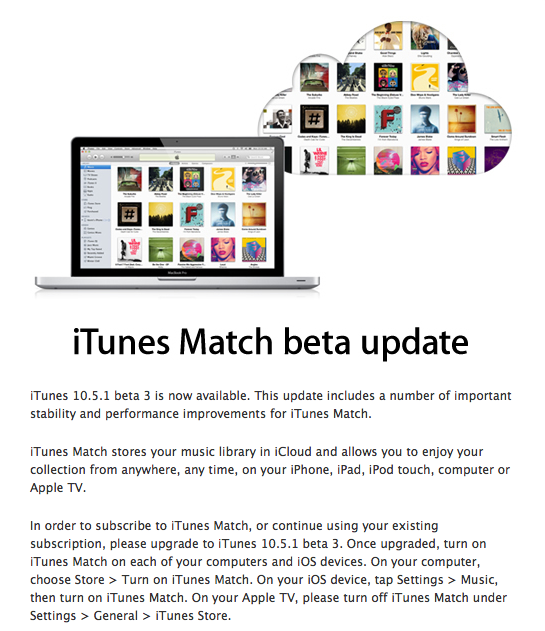 The latest beta, which is now available on the iOS Developer Center, allows for further testing of the new iTunes Match. Apple supposedly wiped all existing iTunes Match libraries stored in iCloud earlier today to “prepare for the launch of iTunes Match“. iTunes Match beta is currently available to iOS developers only in the United States. iTunes Match is Apple’s $25/year subscription service that will match your existing iTunes library with 256-kbps versions in the iCloud. iTunes Match had been scheduled for release in late October, but has been pushed back without any clear launch date available as of now.